These two restaurants are known for their out-of-this-world "churros." Churros are made out of doughnut dough, but instead of being shaped like a doughnut, they are long like a hotdog, though not as thick. They are sprinkled with sugar and are usually hollow in the center. The center can be filled with "cajeta," a soft carmel-like filling, or with chocolate. You can also eat them without any filling - equally delicious! Dip you churros into a cup of hot chocolate and you're in heaven! 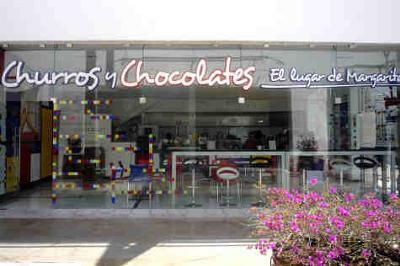 The location at La Luciernaga mall, "Churros y Chocolates," is a pure "churreria." The one downtown in the centro, called Cafe San Agustin (Aan Francisco #21), is a full restaurant. They also serve great breakfasts, lunches and diners. The owner is the famous Mexican TV and theater actress Margarita Gralia. If you come to San Miguel de Allende (SMA) I highly recommend these eateries. You won't regret it! Margarita gralia's churrerías is really very fantastic. This restaurant, started by the actress Margarita Gralia, is an institution. I loves to eat delicious churro. A churro is a fried-dough pastry—predominantly choux—based snack. Churros are popular in Spain, France, the Philippines, Portugal, Ibero-America and the Southwestern United States. I would like to share this article with my friends. That was an awesome and i appreciate this blog. Hello there, Your article is simply awesome to read, Thanks for sharing the amazing facts about the shape,and an intersting fact is that the owner is very popular as she is the t.v and theatre actress. Education positively has significance in this life. The education may be wide and spread an extensive variety of orders yet more often than not ignores the otherworldly way of our lives. A-Writer.com Review good for completing your assignmetns. on the southeast edge of San Miguel de Allende, across the highway from the Tianguis. any taxi driver can take you there. ya me canse de buscar la dieccion para ir, pero no fue posible. habra alguna manera de encontarla?? Nunca se me olvidará la única vez que fuimos a la Churrería. Fue una noche en invierno, con mis hijas y mi esposo. Nos sirvieron deliciosos chocolates, preparados a nuestro gusto, con unos churros buenísimos. Nos llevamos una sorpresota, pues esa misma noche era el cumpleaños de Margarita Gralia ¡y ella estaba allí! Después de que llegaron los mariachis a cantarle Las Mañanitas, ella vino a saludarnos. ¡Qué lindo recuerdo! I had no idea there were TWO Margarita Churrerías! Thanks for completing my post with the full information. Guess what? Now I'll have to drive to San Miguel (from Queretaro, about 45 minutes) to try the new place out. I love your site and the way you engage your visitors - me. I practically live next door and you've got me wanting to go visit SMA... again!